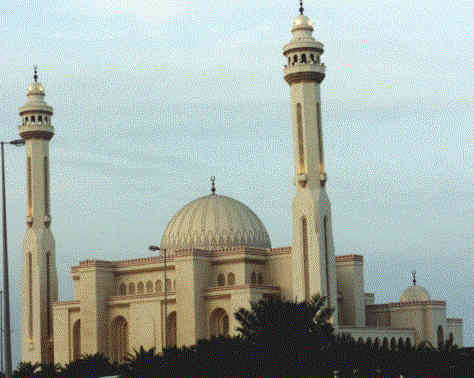 One of the most profound pieces of local architecture is also near my hotel: the Al Fateh Islamic Centre & Grand Mosque. It is magnificent! The body of the building has a square floor plan and is perhaps four or five stories tall. It is about two-thirds as high as it is wide, and is topped by an immense dome. On either side of the front are two towers that must go up ten stories or more. It doesn’t have the effect of being greatly decorated, but on closer look, the lines are actually quite intricate. It was hard to get in. The only entrance to the grounds was via the parking lot, way in the back. I did find my way in, though, and the inside was as impressive as the outside. I am used to mosques as historical buildings, but this one is quite new. It is finished in a very pleasant combination of stone and marble. The space is quite different from a Christian church, with no altar, or even a dominant side of the space, and no extensive decoration. It is sort of how I imagine Quakers might design a cathedral – impressive but simple. It is a square space, with a large, circular chandelier, and the dome high over head. You are required to remove your shoes before entering, which turns out to be very nice, since the whole thing is carpeted. When I was there, a "service" was going on. The mullah was sitting on what looked to me like a folding chair in the middle of an immense space, talking to about a dozen people sitting on the floor around him. Some were lounging in the middle of the space, while others were leaning casually against walls and pillars. There was no standing and kneeling, no praying or singing. Just listening to the fellow talk. I haven’t a clue what he was saying. He was serving the neighborhood as well, though, since he was hooked to a public address system outdoors and could be heard for a good distance around.